If use this! Do I still need to use vaccines for feas? Just put this on my puppy.Don't need to feed the heart worm? Yes, it is a topical treatment. What would you recommend using with this for tick control? You can use this with Advantix or Nexgard for tick control. What is the difference with "Advantage Multi"? It's is the same product branded for a different market. Everything is literally identical. I have one dog ,one cat. 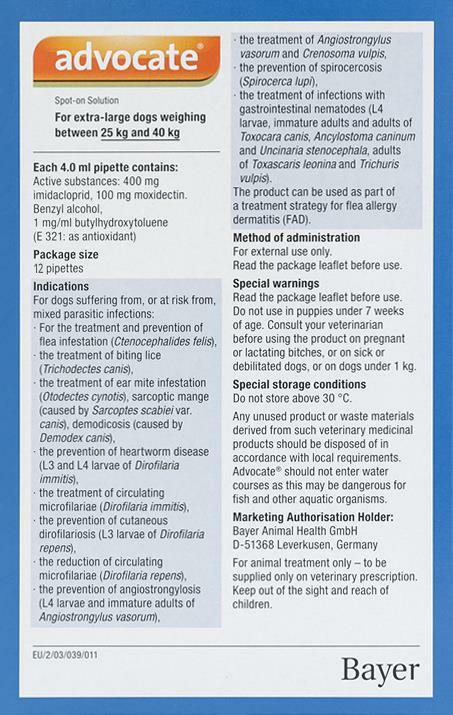 Can I buy Advocate for dog and is it safe at a lower dose on the cat? Ingredients looks the same on both packages. It is the same ingredient but the formulation (liquid to active ingredient ratio) is completely different. There is a tiny amount of liquid in each tube. It is almost impossible to distribute correctly. We recommend you use Advocate for cats for you cats.